I have a schematic with LTC3722-1 and it’s working. But there is a problem. I’m using adaptive ZVS since my supply voltage is high (> 400V) and fixed delay is creating problems with transistor switching (incorrect triggers creating a large current spikes). 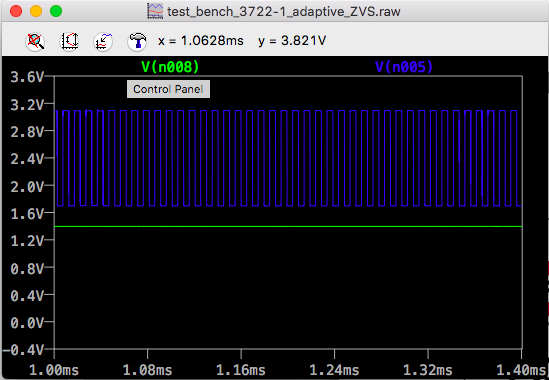 But adaptive ZVS is not behaving like how it’s mentioned in the data sheet. But in simulation, I see the voltage at the PLDY and ADLY pins are level shifted. The controller is not using the voltage levels at the PDLY/ADLY pins to switch the transistors. If you look at the picture below, V(n008) is SBUS and V(n005) in PDLY. PDLY voltage is shifted up!! Why is it happening this way? When the junction voltage (MA/MB or MC/MD) is zero, the voltage at PDLY is > 1.4V!! What is going wrong here? Any help is greatly appreciated.